I am a big fan of needlework. Probably because I've done cross-stitch since I was about 12years old, as well as sewing and bit of quilting. I can appreciate the time this labor of love requires. I am particularly slow with needle and thread, and I have a penchant for LARGE projects. Therefore, I have a reputation among friends and family for embarking on decade-long stitching endeavors. They know I will eventually get it done, they just might not live to see the day. My mother is a stitcher. She first put needle and thread in my hand and taught me how to count the little squares, following the grid of hieroglyphic markings. My childhood home was adorned with hand-stitched sea shells in our bathroom. Our dining room had pastoral scenes of mill houses complete with waterwheels. A few years ago, after noticing the absence of these works on her current walls, I asked Mom what she had done with them. "Those old things?" she replied. "Oh, I think I gave them to Goodwill." I picked myself up off the floor then scolded her for her lack of respect for her own labor. This was the catalyst for my obsession with thrifted needlework. A piece of handmade love really stands out amidst modge-podged puzzle versions of Mona Lisa and brassy framed posters of famous Nascar drivers, the usual Goodwill decor fare. I can't help myself. I have to rescue them! You find them in messy piles at downtown antique shops. Table runners, blankets, napkins, hankies~all beautifully adorned with someone's creative handiwork. I've noticed, however, that shop-owners are getting wise to the value of these treasures, and their prices reflect this knowledge. If you're lucky, you might find a gold mine at an estate sale. This is the best option as they are usually run by impartial middle-men, or out-of-town family; the main goal of both being to get rid of everything as quickly as possible. Wherever you find them~Goodwill or Grandma's attic, please rescue these treasures! Take them home, give them new life. Let them tell you the story of the hands that prepared them. 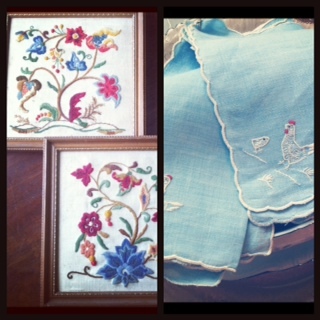 The above images are just a sampling of my needlework treasures acquired over the past year. I'm linking up to Share Your Thrift Haul at Simple Design. Wow! That needlepoint boat scene is incredible! I've been tempted to get some stitched hankies before, but I'm just not sure what to do with them! How do you use yours? Thanks, Emily. I use the hankies as hankies. :) Seriously, they are so much more pretty and practical than kleenex--they don't fall apart after one use, and they don't shred to pieces in the wash if I accidentally leave them in my pants pockets. I wash them with regular laundry in a mesh laundry sack. I love them!